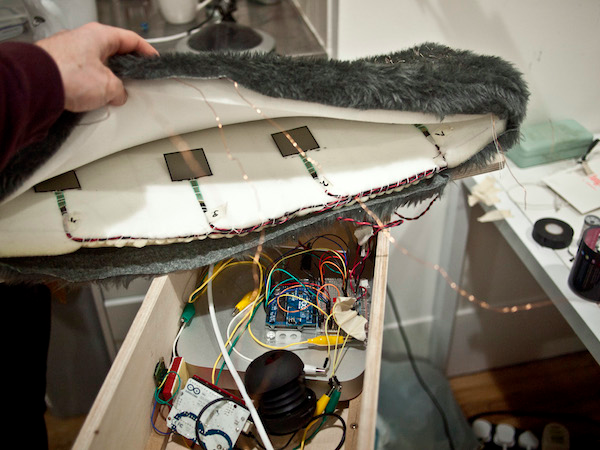 Sonically Responsive Feline Fur #ArtTuesday « Adafruit Industries – Makers, hackers, artists, designers and engineers! Mew from Emily Groves on Vimeo. Mew was part of SoundObject, a collaborative project between Design Products, Information Experience Design and Visual Communication students at the RCA, London. I worked in a fantastic team with Jackie Ford, Jakub Pollág and Paula Arntzen. Brief Interpretation: to create a digital and physical object that responds sonically to people and its surroundings. We were inspired to make an unusual and intriguing object that would respond to people in a surprising way. We wanted to do this by mixing up physical and sonic affordances of objects concepts and materials. Our idea was to make an object with a hint of the visual qualities of a cat, but that certainly was not a representation of one. It would then sonically respond with manipulated, but recognisable feline sounds. Outcome: Our final outcome was Mew, an interactive sound piece. As you walk towards the curious and gawkish object, it begins to emit a soft purring sound. This tells you that the object is responsive and encourages further interaction. If you stroke the fur, it will emit distorted meow sounds that are manipulated by the direction your hand moves. Pushing on the object will also alter the sounds, but pressing too hard will make Mew hiss. 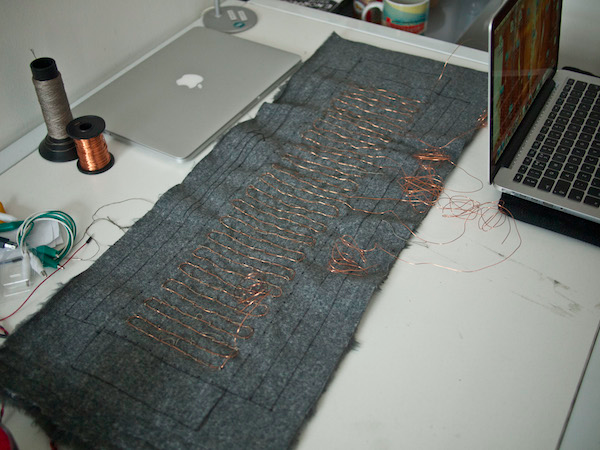 Process: To make stroking interactive, we sewed conductive thread into the fur in four different circuits. Each circuit was attached to a capacity sensor with readings being taken by an Arduino. To add another dimension we put four pressure sensors in the foam beneath the fur that also sent readings of how hard the foam was being pressed to the Arduino. 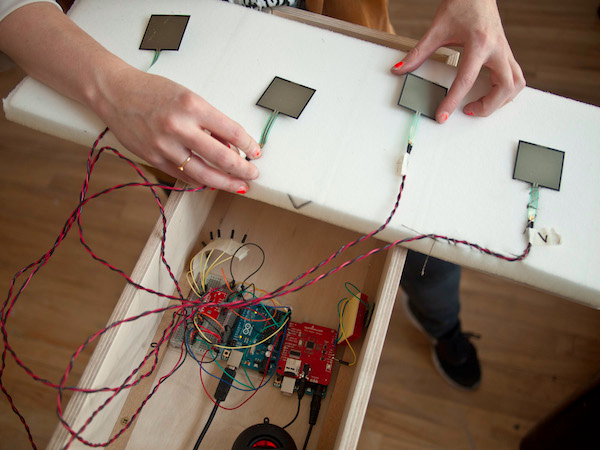 The readings from these sensors were then sent from the Arduino software to Max, a visual programming and dataflow environment, often used for sound and visual installations. We used Max MSP to create effects for the sounds and to control the way sounds were played back. For instance, we programmed a screech sound to be emitted only if it was pushed over a certain degree. We ran Max off a Mac mini hidden inside the body of Mew.